A favorite gathering place for Grand Hotel guests is the Esther Williams Swimming Pool. The 220-foot-long, serpentine-shaped heated pool is a popular gathering place. Take a refreshing dip, soak up some rays on the deck or relax on one of our lounge chairs overlooking the pool and the Straits of Mackinac. Guests are also welcome to enjoy our sauna and two whirlpools on the pool deck. Poolside food and beverage service is available from the Pool Grill (seasonal) and complimentary snow cones are served daily (while supplies last). The Esther Williams Swimming Pool is named after the actress and competitive swimmer who starred in the 1947 movie This Time for Keeps, filmed at Grand Hotel. 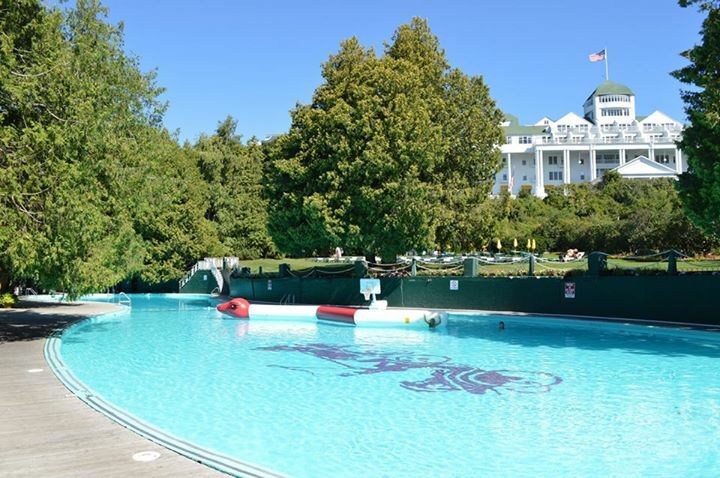 The pool is named for the actress Esther Williams who starred in the 1947 movie, “This Time For Keeps”, filmed on Mackinac Island and at Grand Hotel. The movie has classic scenes of Mackinac Island in the 1940s with shots of sleigh rides through the streets of Mackinac Island in the winter and summer scenes of Grand Hotel and the Esther Williams Swimming Pool. Anyone who has rented a bicycle on Mackinac Island will get a kick out of seeing Jimmy Durante riding on the back of a tandem bicycle through the streets of downtown Mackinac Island. A DVD of the movie was released in the fall of 2009.